The North Eastern Steam Fishing Co Ltd, Grimsby (George Doughty, Manager). News report: The Telegraph (Grimsby), Thursday 3rd September 1914. ONLY TWO OF THE CREW SAVED. 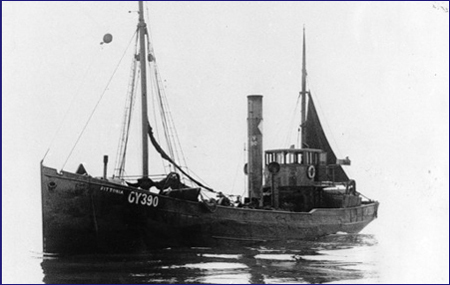 "As announced in our late special edition last night, the Grimsby trawler, reported at first to be named the Fortunia, which was blown up by striking a mine, turned out to be the Fittonia, owned by the North Eastern Steam Fishing Co. The owners last night received a telegram from Scarborough to say the Fittonia had been blown up 27 miles E.N.E. off Spurn, and that only two of the crew were saved. The saved men are -. Barnard (trimmer), and A. Ollson (deck hand), who were landed by the drifter Prolific at Scarborough. It subsequently was learned that the two men were picked up by the trading steamer Barratoria, of Hartlepool, which was nearby when the disaster occurred. She transferred the men to the Prolific, which was going into Scarborough. The men were handed over to the Shipwrecked Mariners' Society. The Fittonia left Grimsby last Thursday morning and was probably on her way home when the disaster happened. The list of the crew missing is as follows:"
CONDER Harry (48), Skipper Certificate No.2389. "Leeds" 1902, "Veronica" 1903, "Dahlia" 1906, '07, '08 & '09, "Verbena" 1910, "Algoma" 1911. DOWLER, John Frederick (31), Cook. 13 Bentley Street, Cleethorpes. Son of Walter and Kate Mary Goode Dowler, of 24, Windsor Street, Leamington, Warwickshire. GUDGEON William A. C. (41) Second Hand, Cert, No.7421. Son of Mrs M. Gudegon, of 14, Garner Street, Grimsby. Born London. HAMMERTON M. (47), Second Engineer. Husband of Alice Hammerton, of 61, Barcroft Street, New Cleethorpes. Born at Ringstead, Northants. HILL William. (40) Third Hand. Son of the late Mr. and Mrs. Hill; husband of Deborah Hill (nee Wilson), of 227, Weelsby Street, Grimsby. Born at Birkenhead. MAGNUSSON H.J. (29) Deck Hand. 320 Burgess Street, Grimsby. Born in Iceland. WILTON Joseph (65) First Engineer. Husband of Elizabeth Wilton, of 55, Barcroft Street, Grimsby. 23 September 1914 S.T. REBONO GY 731. Aug.1912 Registered Rebono GY 731 by G.F. Sleight, Grimsby. The "Rebono" and "Remagio" left Grimsby for the North Sea on Wednesday 23rd September, and about one o'clock in the afternoon the "Remagio" went ahead, being about two miles in front of the "Rebono" when the explosion took place. When 26 miles E. by N. of Spurn the later vessel struck a mine aft, and the explosion smashed the stern post and flung a great deal of metalwork into the air. The third hand F. Brewster was killed in his bunk. The ship begun to founder at once, and the skipper and the rest of the crew took to the boat, which, although placed aft, had luckily escaped being damaged. The skipper of the "Remagio" hearing the explosion, at once turned his boat round and steamed to the scene of the disaster passing four mines on the way, but by the time he arrived the "Rebono" had sunk out of sight, only ten minutes elapsing since the explosion. The crew were picked up and brought back to Grimsby. BREWSTER, Frederick William. (39) Third Hand. Son of the late Mr. and Mrs. Brewster; husband of Ann Eliza Dixon (formerly Brewster, nee Jackson), of 42, Taylor Street, Grimsby. BURGESS, George (38) Skipper, Certificate No. 7113. Husband of Annie E. Burgess (nee Dixon), of 271 Brereton Avenue, Cleethorpes. Born Cleethorpes. Pre-War Skipper of Grimsby trawlers "Restless" 1904 & 08, "Rialto" 1909/10/11/12, and "Rebono" 1912/13 & 14. McBRIDE, Peter (37) Mate, Certificate No.6648. Former Grimsby Sea Fishing Apprentice, signed indentures 8 Sept. 1893. Husband of Lydia McBride (nee Ball), of 25 Hildyard Street, New Cleethorpes. 1911 Crew list: "Rialto", A. Johnson 2nd Eng. 39 Manchester. 1913 Crew list: "Andes", G. Cross 2nd Eng. 52 Durham. Built 1896 by Cochrane, Cooper & Schofield at Beverley. Feb.1896 Registered Ajax GY 18 by W. Grant, Grimsby. The "Ajax", sailed from Grimsby on the a.m. tide (9:00 - 11:30), Wednesday 26 August 1914. Skipper H. Baker, of the trawler "Cygnus", which arrived in dock Wednesday night, reported having picked up, at eleven o'clock yesterday morning, on the way to Grimsby, a buoy belonging to the "Ajax". This was about 29 miles E. 3/4 N. of Spurn. There was also floating on the surface of the water a piece of wreckage which had apparently formed part of the life-boat, together pound boards and dead fish, mostly cod. The trawler "Gardenia", which was outward bound, also passed the spot, and picked up another life-buoy carried by the "Ajax". Ship presumed mined, given up as lost with all nine hands, listed below. Born: Grimsby. Son of Mrs. Bacon, of 204, Victor Street, Grimsby. Born: Greenwich. Husband of Mrs Bayes, of 5, Fairmont Road, Grimsby. COLEMAN, J.C. (40), Second Hand, Certificate No.6102. Born: London.Husband of Mrs. Coleman, of No. 2, Row 140, Great Yarmouth. ELTON, W.J. (30) Fourth Hand. Born: Leicester. Husband of Mrs. Elton, of 1, Ripon Street, Grimsby. GRANT, Edward. (32) Skipper, Certificate 7473. Born Hessle, Hull. Husband of Emily Hill. His true name was Edward Moore Hill, son of Rose Hill. Less than two years after Edward was born, Rose Hill married Thomas Grant. Edward was brought up as a Grant, but when he married Emily in 1904 he used his true family name; Edward Moore Hill. Alfred Grant who was also lost on the Ajax, was his half brother. Edward continued fishing using the name Grant, his skippers certificate issued in 1908 is to Edward Grant. He was Pre-War Skipper of Grimsby trawlers: "Malta" 1911, & "Ajax" 1912/'13/ & '14. n.b. Family history provided by Edwards grandson Brian Hill - to be continued. GRANT, Alfred. (25) Third Hand. Born: Cleethorpes. Husband of Mrs. Grant, of 143, Ayscough Street, Grimsby. NAYLOR, F. (21) Fourth Hand. Born: Grimsby. Husband of Mrs. Naylor, of 18, Trinity Street, Grimsby. PETTMAN, J.W. (50) First Engineer. Born: Hull. Husband of Mrs. Pettman, of 24, Thesiger Street, Grimsby. Born: Leicester. Husband of Mrs. Potter, of 90, Havelock Street, Grimsby. Built 1907 by Cook, Welton & Gemmell at Beverley. Sunk by a mine 25 miles E. 1/2 N. of Spurn Lightship. The Telegraph (Grimsby), Final Edition, Monday, September 7 1914, reported in the Latest News Column that the trawler "Revigo" had been mined that morning and that the trawler "Andromeda" sighted a ship's boat containing 11 men, skipper and crew of the trawler, who were at once picked up and landed at Grimsby early that evening.
" As announced in our Final Edition on Monday night, another Grimsby trawler has been blown up by a mine. The vessel was the Revigo, this making the third vessel belonging to Mr G. F. Sleight lost, the other two, the Rideo and the Rhine having been sunk by the Germans a few days ago. The complete story is not yet to hand, but so far as as can be gathered it was about 11.30 in the morning when the vessel struck a submerged mine. The explosion took place under the engine room, shaking the ship from bow to stern and causing her to plunge forward. Part of the bridge was blown away and the skipper, Captain Walter Lewis, was thrown to the deck, sustaining injuries to the head and body. The chief engineer, who was in his bunk at the time, was thrown out and struck his head against the under-deck, while in the engine room, the second engineer was badly scalded by escaping steam. The steward was also injured. There was no time for the crew to collect any of their effects and with all haste the ship's boat was launched and the crew left their ship with haste, only ten minutes elapsing between the explosion and the sinking of the trawler. After being afloat for about an hour, the boat was sighted by the skipper (Capt. Richards) of the trawler Andromeda and they were at once taken aboard and brought to Grimsby, where they landed about half-past six in the evening." 22 September 1914 S.T. KILMARNOCK GY 454. Built 1897 by Mackie Thomson, Govan. Dec.1897 Registered Kilmarnock GY 454 by Hagerup & Doughty, Gy. Apr.1906 Sold to Consolidated Steam Fishing & Ice Co. Gy. Sunk by a mine 31 miles E. of Spurn Point. 6 lives lost. The Grimsby trawler "Kilmarnock" belonging to the Consolidated Co., Grimsby, was blown up yesterday by a mine in the North Sea. So terrific was the explosion that the trawler was almost completely shattered, and she sunk within a minute. The chief engineer, a man named Risdale, was hurled through the skylight and it is stated, both his legs were fractured. Out of a crew of nine, six were either killed or drowned, and the only survivors are the mate, the third hand and the chief engineer. These three were picked up by a minesweeper. The chief engineer was conveyed to a hospital ship in the Humber, and the mate and third hand were landed at Grimsby. The Kilmarnock only left Grimsby yesterday, and the disaster occurred soon after leaving the Humber. John F. Risdale, Chief Engineer, of 59 Suggitts Lane, Cleethorpes. John F. Outhouse, Mate, of 23 Tiverton Street, New Cleethorpes. Sam. H. Brook, Third Hand, of 54 Tunnard Street, New Cleethorpes. FELSTEAD, Joseph Ambrose. (31) Second Engineer. Son of Mrs. Griffin (formerly Felstead), and the late Mr. Felstead. Husband of Bertha Teresa Felstead (nee Perry), of 62, Fraser Street, Grimsby. Born at Grimsby. of 169, Brereton Avenue, New Cleethorpes. Born Woolwich. Pre-War Skipper of Grimsby trawlers: "Queenborough" 1899-1900, "Oxford" 1902, "Newhaven" 1903/04/05 & 06, "Ashton" 1906, "Grimsby" 1908/9, "Eastbourne" 1909, "Harwick" & "Jedburgh" 1910, "Alroy" 1911, "Perseus" 1912 & "Kilmarnock" 1913/14. MCLOUGHLIN, Joseph. (19) Deck Hand. Son of Charles and Isabella McLoughlin, of 46, Trinity Street, Grimsby. 224 Victoria Street, Grimsby. Son of the late William and Rose Secker. Husband of the late Sarah Secker. Born at Southrepps, Nr. Cromer, Norfolk. THOMAS, Simon Henry. (46) Trimmer. Of 37 Hope Street, Grimsby. Born at Yarmouth. TILLSON, John Edward. (19) Deck Hand. Son of George Arthur and Emily Tillson, of 22, Nelson Street, Grimsby.